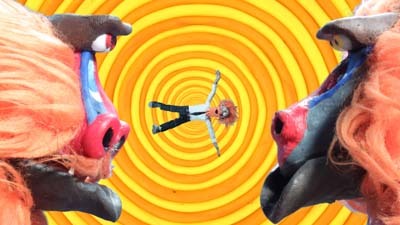 Our brand new film 'My Neighbourhood has been overrun by Baboons' has been selected as 1 of 16 to be part of Movie Extra Tropfest 2010. It is the biggest short film festival in the world, so if we win it, we are practically the best film makers in the world! Okay maybe not quite...yet. The event will be held on the 21st of Feb in Sydney and broadcast live to seven other sites in major cities around Australia as well as telecast live on Movie Extra channel. It is a free public event, so come along and cheer on Baboons! For more info check out the Tropfest website. The screening will be the film's premiere so we hope you enjoy it! We've been working on Baboons for about 6 months, finishing in January 2010, just one day before the Tropfest entry deadline! Man are we glad we got it done just in time. The film proved to be a very challenging project, especially with the looming deadline. We were working around the clock for the last couple of months but it makes it all worthwhile getting selected in Tropfest. Having our film screened in front of 150,000 people is the biggest reward we could possibly hope for. Now we've just got to hope a few of those people like it! We are eagerly looking forward to attending the event in Sydney but hope that our family and friends in Adelaide all get down to Glenelg to cheer on Baboons with the rest of South Australia. It is the only SA finalist film this year. To find out more about how we made the film, check out the Behind The Scenes. 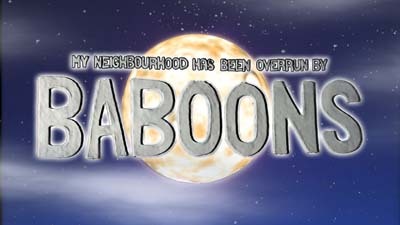 My Neighbourhood has been Overrun by Baboons is a film clip to a song by Adelaide band The Dairy Brothers. Their comic rock song forms the ideal backing to this crazy story. What if you woke up one morning and your neighbourhood had been overrun by baboons? Would you go bananas?